A MAN, 35, from Bedford, was remanded in prison with another local man charged with at least seven hold-ups in businesses in Torremolinos and Benalmadena. The National Police began investigating at the end of last month when two violent robberies in supermarkets were reported in the area. The two suspects threatened cashiers with a firearm and stole cash from the tills before fleeing. Evidence led them to two residents of Benalmadena who were known to the police. Both of them checked for police presence whenever they travelled along the coast and normally travelled apart, one on a stolen motorbike and the other in a car. Only occasionally did they travel in the same car, which had had the number plates changed. One of them was arrested immediately after holding up a local store and a firearm was seized as well as the cash from the robbery. The police then went to the home of the other man to arrest him. 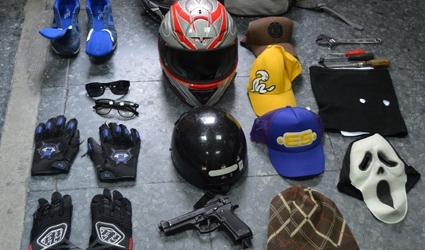 In their homes, police seized the clothes used in the robberies, a till, and other items.